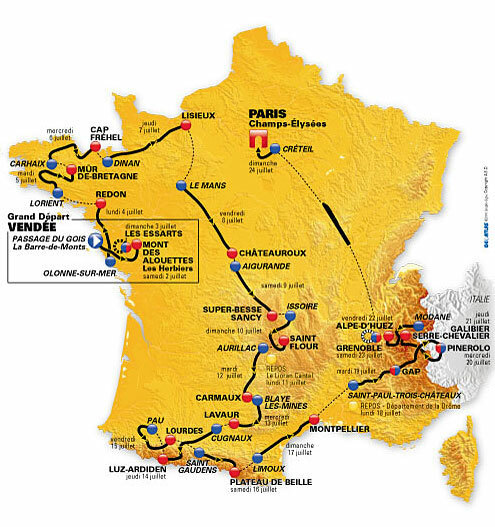 I have to call out the Tour de France race organizers for an awesome website this year, with detailed route maps of each stage including streets and towns and everything. 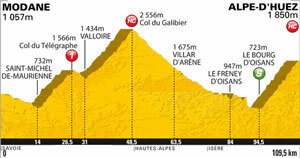 And detailed elevations of each climb. Check it out! Greetings all! 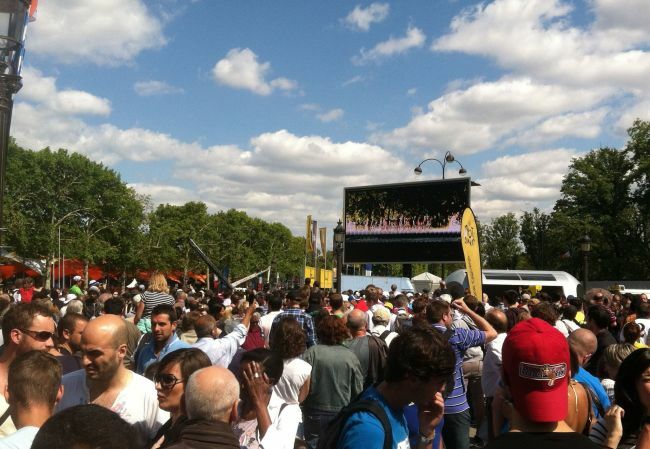 As I did last year (and the year before), I'm going to post about each stage of the 2011 Tour de France ... that way you can read them after you've watched on your Tivo (! ), or skip them if you're not interested. This year the Tour doesn't have a prologue (!) 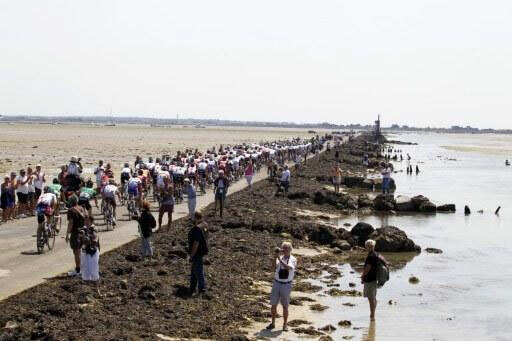 - the traditional short time trial to "seed" the riders - instead we opened with a procession across the famous Passage du Gois, followed by a flat stage with a pretty steep uphill finish. 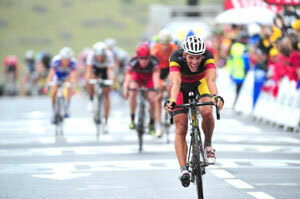 The setup favored Philippe Gilbert, who's has an amazing classics season so far, and indeed he won. Cadel Evans nearly caught him at the end with a terrific effort to take second, and to gain a few seconds on the peloton. More significantly there were several crashes near the end; none took out any riders, but one cost a number of riders big time, including Albert Contador who finds himself 80 seconds behind most of hit competitors, in a stage which wasn't expected to affect the GC. Commentating on the commentating: I'd finally gotten used to Craig Hummer but NBC's Liam McHugh has taken his place. Blech. Craig didn't know much but he at least pretended to be engaged; Liam seems amazed by the sport. Surely they could have found someone who knew something? Not impressive. At least Phil Liggett and Paul Sherwin have retained their form. Tomorrow we have the team time trial which should be most interesting; I'm picking Radio Shack to win, and Saxo Bank (Alberto's team) to lose more time. Stay tuned! Don't you just love team time trials? I do. 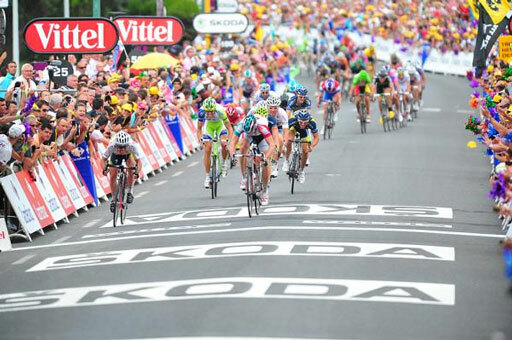 Great to watch, and a great addition to any stage race, as it truly features a team performance. 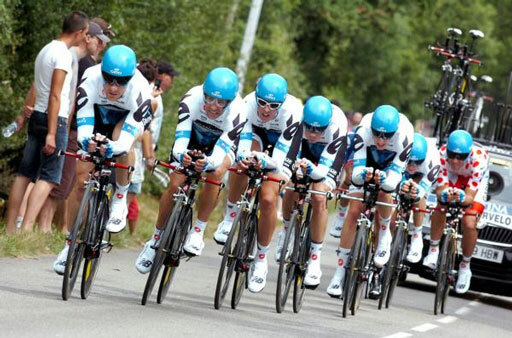 Today Garmen-Cervelo narrowly won - their first stage in the TDF! 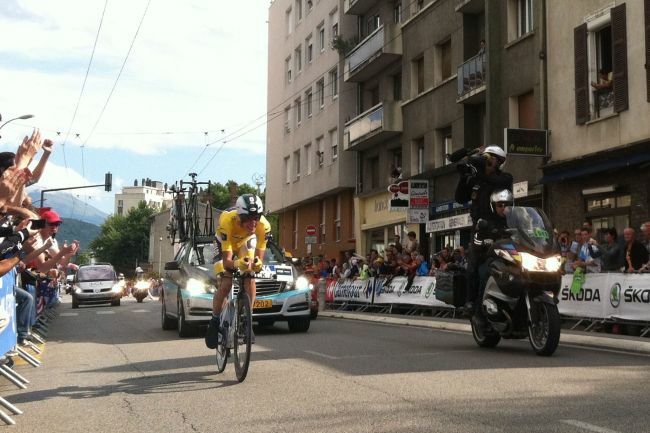 - edging BMC and Sky by 4 seconds, Leopard-Trek and HTC by 5, Radio Shack by 10, and Rabobank by 12. Yes it was that close. 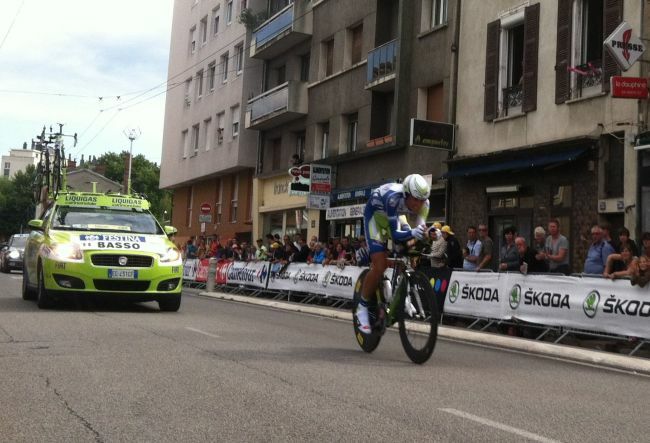 Unfortunately for Alberto Contador Saxo Bank were not close, and finished 28 seconds back. 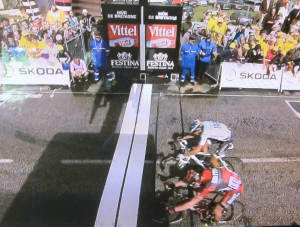 The net leaves Thor Hushovd in yellow, with David Millar in second at the same time, and Cadel Evans third one second back. You could see Thor keeping that yellow all week. Early days but exciting! 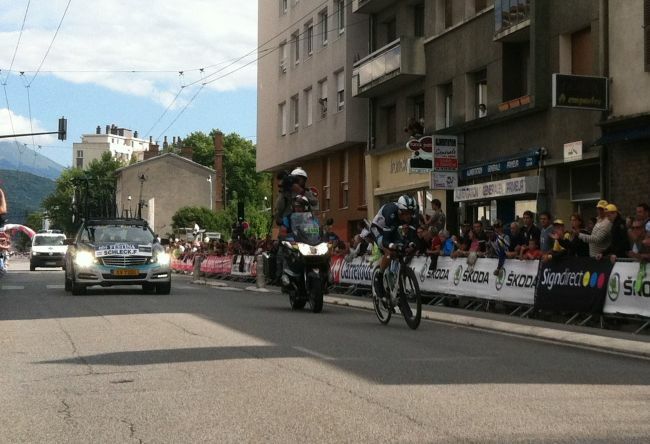 Philippe Gilbert keeps his green and polka dot jerseys as there were no point awarded in either competition today. 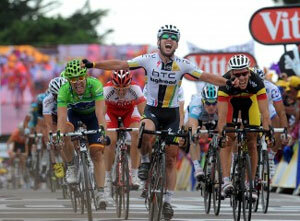 Tomorrow is a dead flat sprint - look for an amazing Cavendish / Farrar / Petacchi battle! Tyler Farrar blasted out from a bunch sprint to win today's stage 3, featuring a golden leadout by teammate Thor Hushovd, who keeps yellow. I thought HTC started too soon for Mark Cavandish, and Lapre never got themselves organized for Alessandro Petacchi. Surprise Spanish sprinter Joaquin Rojas Jose of Movistar scored consistently all around to move into green, and Philippe Gilbert kept his polka dots. I like the change to the rules wherein each days features one intermediate sprint that means more to the overall sprint standings; it has given us something to watch midway through what would otherwise be pretty boring days in the flats. There was one climb - a high bridge - which made for beautiful views but didn't do anything to the standings. Tomorrow's stage should be a bit weird; it kind of looks flat, but there's a hilltop finish on a Cat 3 climb at the end to make things interesting. Everyone seems to think Gilbert is going to win, but I look for Contador to establish himself, and Evans will be trying to take yellow. Stay tuned! Excellent TDF stage today; a long rolling punishing ride in the fog and rain, followed by a surprisingly tough final 3km climb to a hilltop finish. It made for some great racing; everyone thought perhaps Philippe Gilbert would win as he did on stage one, including his team and perhaps Philippe himself, but instead Cadel Evans marked him and out-powered him to the finish, holding off a last-second attack by Alberto Contador. 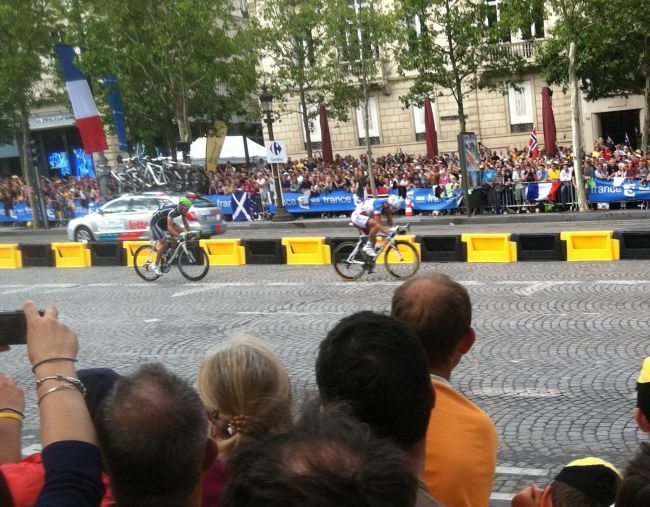 Thor Hushovd somehow hung with the leaders to get the same time and stay in yellow. Great stuff. The GC was largely unchanged with only small time gaps, but the psychological damage was done. We now know that Evans is here for real, and Contador can be beaten uphill, and Gilbert is not invincible, and Hushovd is stronger than dirt. And the Garmin and BMC teams are here to win. And Radio Shack too, although Chris Horner flatted at just the wrong moment and missed his chance to mix it up on the final climb (would have been a good chance for him too). And finally how great was it to see Alexander Vinokourov right there at the end. It's gonna be a great Tour. 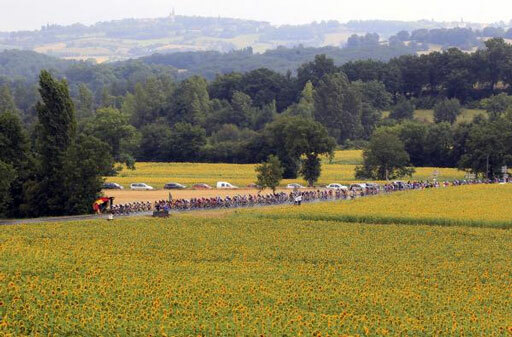 Whew, today was one of those days on the tour; what looked to be a quiet little day along the Brittany Coast turned into carnage as the nervousness of the peloton and the narrowness of the roads combined to yield several nasty crashes. A stiff crosswind made the finish "interesting"; but in the end it came down to a bunch sprint, with Mark Cavendish prevailing over green jersey -wearer Juan Rojas and Philippe Gilbert. Pretty much everyone got the same time so the GC is unchanged. Tomorrow's stage is the longest in this year's tour and features rollers all through; to me it looks like an ideal stage for a breakaway to succeed, especially after all the damage today. It will be most interesting to see who lines up to escape, and whether the field lets them go; a complicating factor is the new intermediate sprint point. 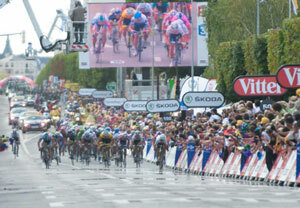 Probably a successful breakaway will have no more than five or six riders. We'll see! Today promised to be a lot more interesting than it was; such is the Tour. (There are other days when you tune in thinking you're going to see three hours of parade followed by 30 seconds of sprint, only to see fireworks all through.) I expected a breakaway to stay away, but instead a rather weak five-man group hung off the front, closely monitored, as the peloton drove on through the rollers amid rain, all of which culminated with a rather disorganized bunch sprint on a slight incline. 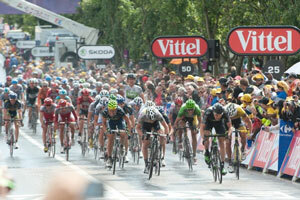 Edvard Boasson Hagen of Sky blasted to the front, closely pursued by Philippe Gilbert and Thor Hushovd. None of the true sprinters gave it a go. I think today the mid-race sprint point worked against an interesting break. The sprinters' teams kept the pressure on and nobody could get away. Perhaps a stronger / larger break would have worked, but on the other hand a stronger / larger break wouldn't have been allowed to form in the first place. Bad luck for Levi Leipheimer; he crashed just outside the 3km boundary, and by the time he was back up and chasing the field was in full sprint. 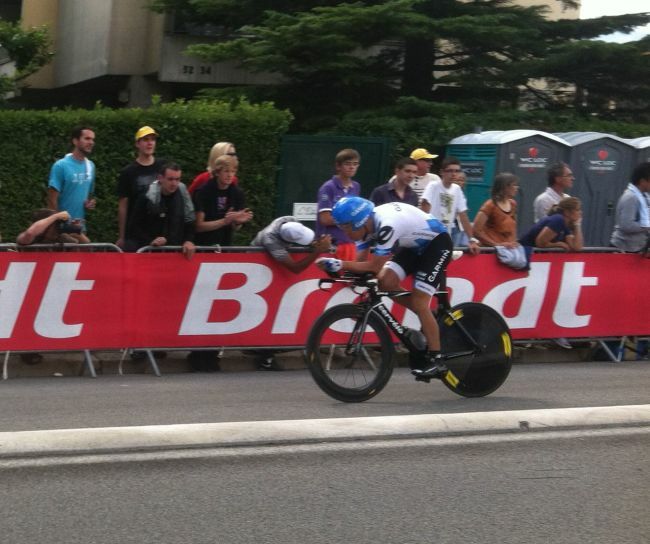 He ended up losing a minute on GC which he'll definitely wish he had back later in the Tour. 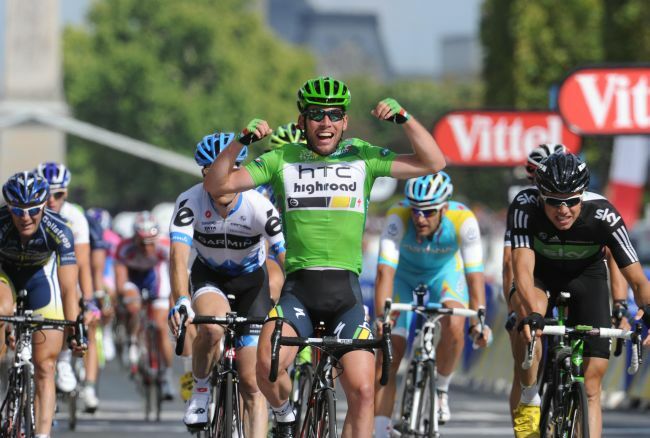 A long, wet, windy stage 7 from Le Mans to Châteauroux ended with Mark Cavendish winning another bunch sprint, his 17th overall (! 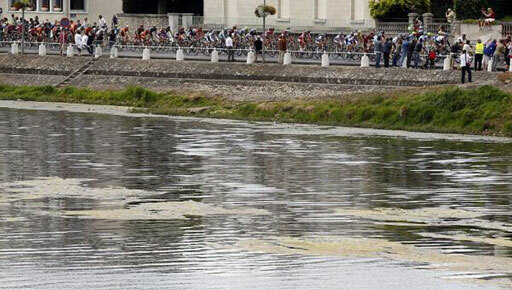 ), but the big news was crashes which took out Bradley Wiggins and cost Chris Horner and Levi Leipheimer big time. Alexander Vinokourov also hit the deck. 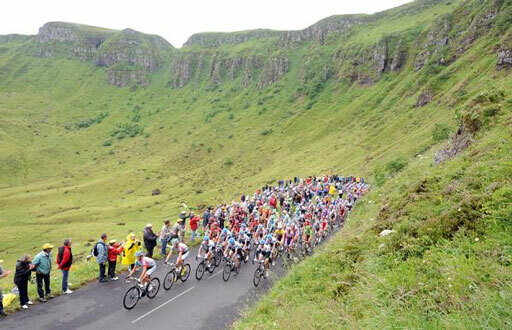 It was one of those stages where you could say the Tour cannot be won, but it certainly can be lost. 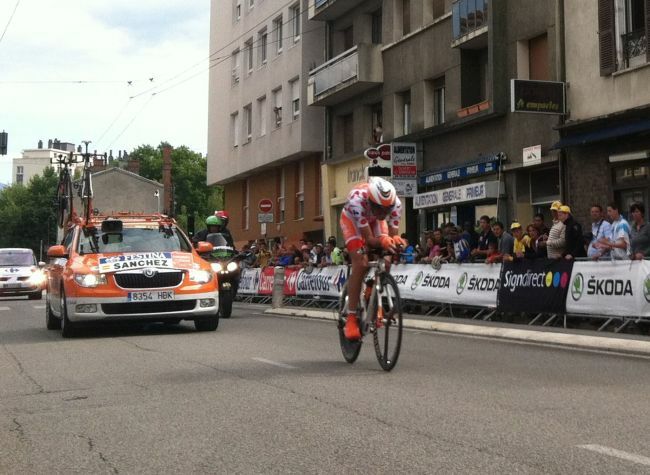 Tom Bonnen retired early on from injuries sustained in stage 6. Wow. Stage 9 of the Tour had a little of everything; eight categorized climbs (some of those Cat 2s were pretty tough), a powerful breakaway destined to succeed, horrible crashes which took out several contenders and injured others, and a TV car running riders off the road, changing the results of the race. If you missed it, go back and watch. Wow. 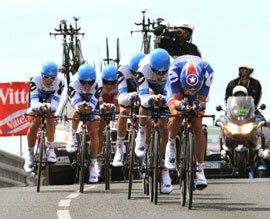 Today's break was not five guys out to get TV time for their teams, they knew they had a chance, and they rode like it. Chasing behind the peloton had a number of horrible crashes, and Dave Zabriske, Alexander Vinokourov, and Jurgen van den Broeck were forced to retire. With the finish in sight a TV car swerved into the five-man breakaway, hitting Juan Antonio Flecha and knocking him to the deck, and causing him to crash into Johnny Hoogerland who somersaulted into a barbed wire fence. 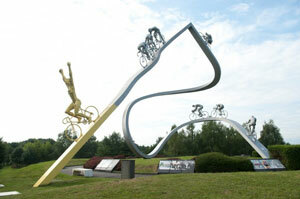 This enabled Luis-Leon Sanchez and Thomas Voeckler to escape, with Sanchez ultimately winning the stage but putting Voeckler solidly in Yellow, two minutes ahead of the GC contenders. With a rest day tomorrow that leaves the GC at Voeckler in yellow, Sanchez (1:49), Cadel Evans (2:26), Frank Schleck (2:29), and Andy Schleck (2:37). 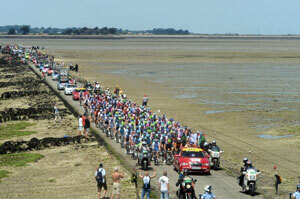 Other contenders include Andreas Kloden (2:32), Ivan Basso (3:36), Robert Gesink (4:01), and Alberto Contador (4:07). You could have won money betting that Contador would be in 16th that far back after week one. After the rest day there are a couple of days for the sprinters - 5 hours of touring followed by 5 minutes of racing - and then Thursday (ta da!) 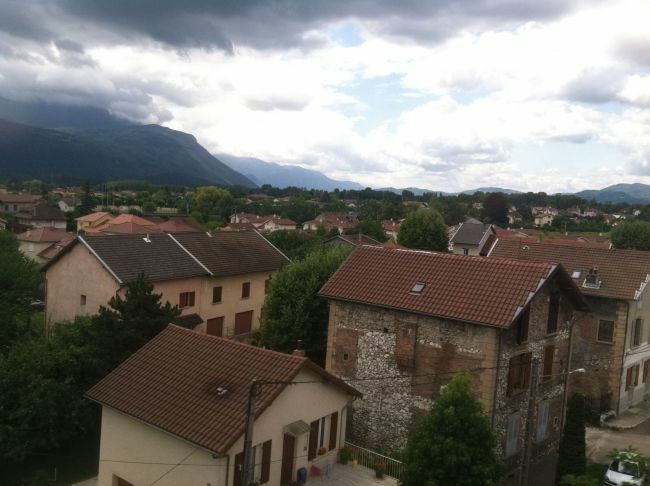 we go into the Pyrenees, with stage 12 featuring a Cat 1 and two HCs. Yay. Stay tuned! 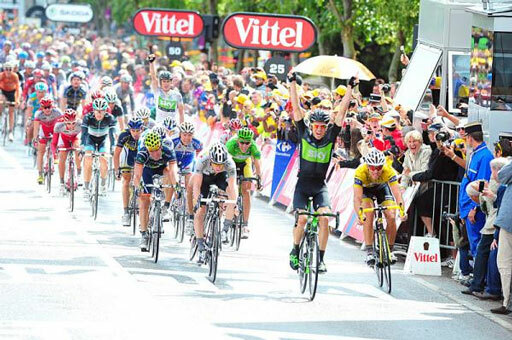 Today's stage 11 of the TDF was the most boring yet; a long flat ride through the middle of France which ended in a bunch sprint and Mark Cavendish winning again, giving him the green jersey. Ho hum. 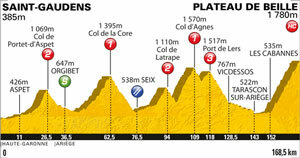 But tomorrow there will be fireworks, as the Tour moves into the Pyrenees and we have the first real climbing stage. 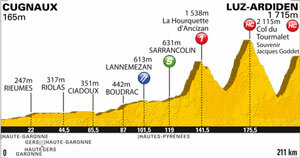 It will be the first real selection with the GC contenders battling on the final climb. 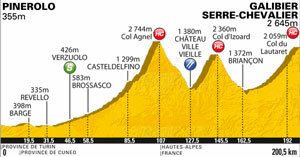 Alberto Contador is going to have to take time back somewhere, and I suspect he'll try to do it here. 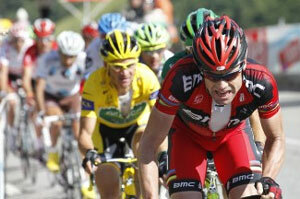 Cadel Evans will just need to stay close. And Frank and Andy Schleck, well, they need as much time as they have and more to hold off Alberto and Cadel, who are better time trialers. Actually the next three stages are all killers; the whole complexion of the tour will be different by the end of the weekend. (See John Wilcockson's analysis for more...) I can't wait! 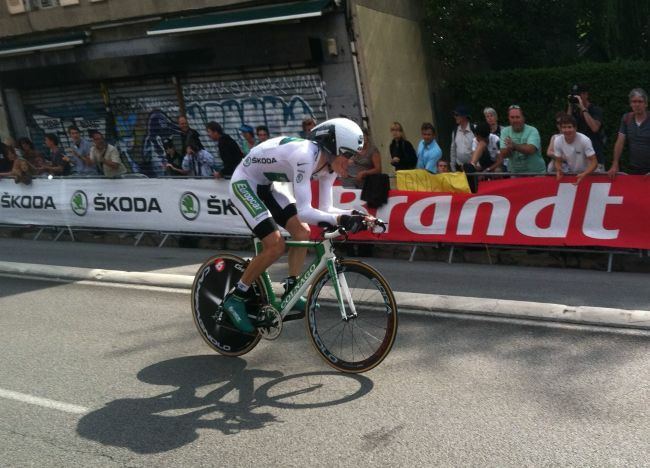 Thomas Voeckler is magnificent! 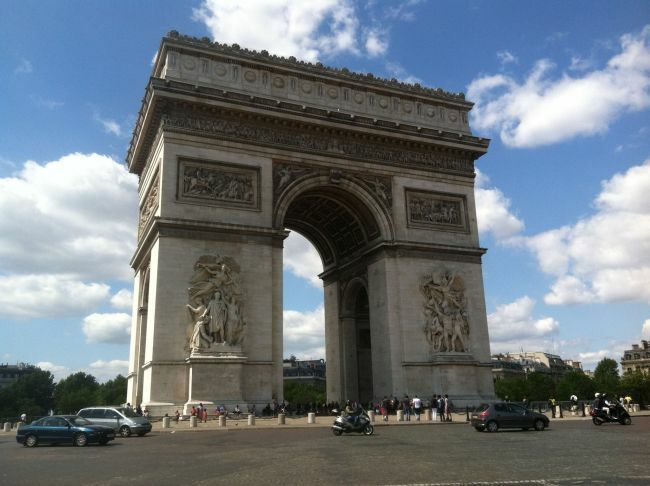 On Bastille Day he hung right up there with the strongest climbers in the world to keep his yellow jersey. 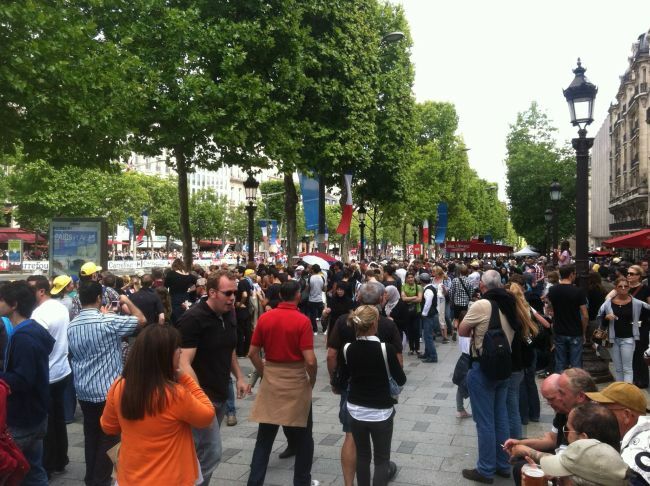 Vive Le France! Sammy Sanchez can pedal up an elevator. When he attached on the final climb up Luz-Ardiden nobody could follow him, it was only a matter of whether he burned himself up. He has the polka dots now and he could keep them all the way to Paris. 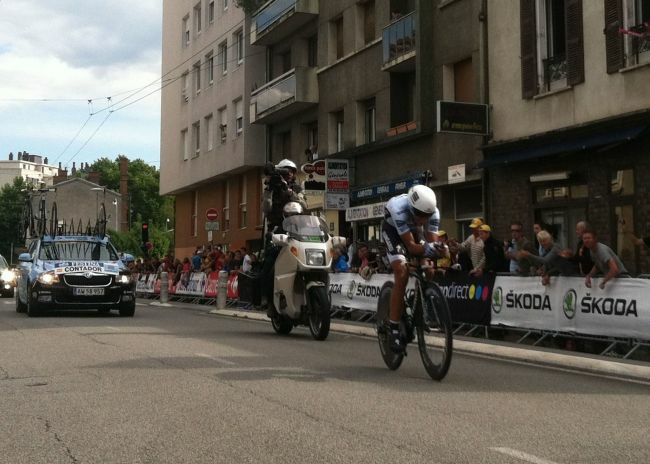 Frank Schleck is en forme. When he attached at the end, the GC contenders could not go with him. He ran out of road or he might have caught Sanchez too. Ivan Basso is looking great. 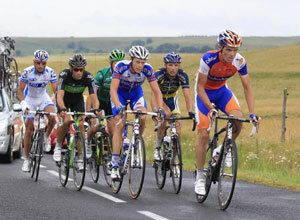 He hung right in there with everyone, calm and cool, and finished in the lead of the GC contenders' pack quite easily. He's a good time trialist and if he continues to climb like this, look out. 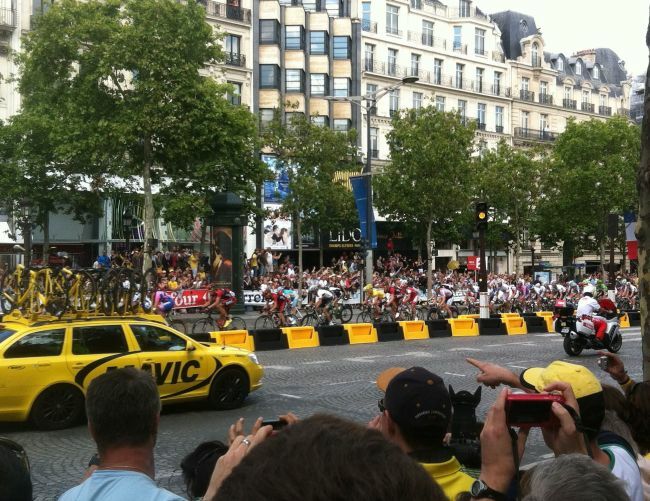 Remember he finished second to Lance twice. Cadel Evans is looking great too. As the guy with the lowest time of the GC contenders and as a great time trialist himself, he doesn't have to attack, just hold serve. Which he did. 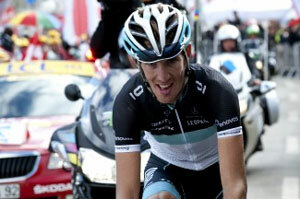 Andy Schleck was pushed. 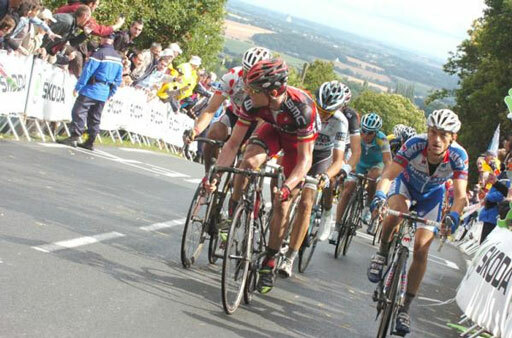 Yeah he finished with the GC men, but he had to work to stay up there. Interesting. Alberto Contador is hurting. He will heal and get stronger, but today he could not follow Frank's attack, and in fact he lost more time on the GC pack at the finish. The key to this Tour is how fast he heals, can he be the Contador of old in the Alps? 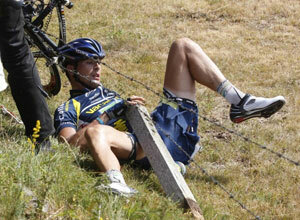 Andreas Kloden was hurt before this stage, and fell again during. I think he's too injured to be a factor. Too bad, because like Basso he's finished second twice and he's a great rider. 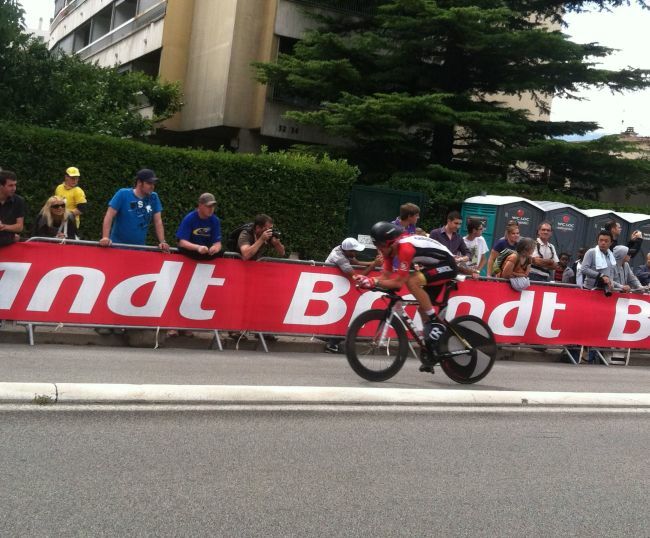 Levi Leipheimer is a great rider but can't climb with the world's best. He was dropped there at the end. Boo. The Shack are snakebit in this Tour. Robert Gesink is too injured to be a factor. Luis-Leon Sanchez is not a world-class climber. 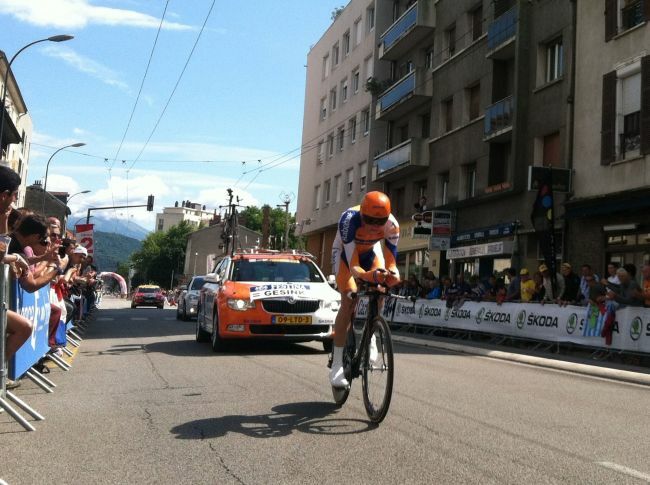 Looks like Lawrence Ten Dam (aka "wolfman") is Rabobank's best hope for a high GC spot. Tom Danielson looks to be the top American on GC, riding for Garmen. Christian Van de Velde will be a good ally for him, and Garmen have the second strongest team in the race. Leopard Trek have the strongest team, no question. 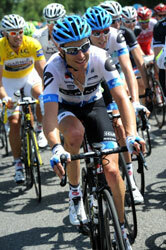 Fabian Cancellara, Jens Voigt, Stuart O'Grady, man. 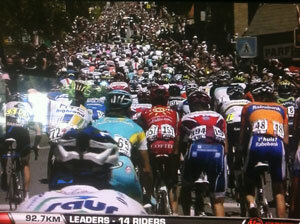 They drove the peloton up the hills in this stage. I gotta say, I love Jens Voigt; not only did he absolutely power the peloton over the hills in this stage, he has a blog, and recently did a great interview of his teammates the Schlecks (PDF) in Bicycling Magazine. Go Jens! Well that was great, so what's on for stage 13? 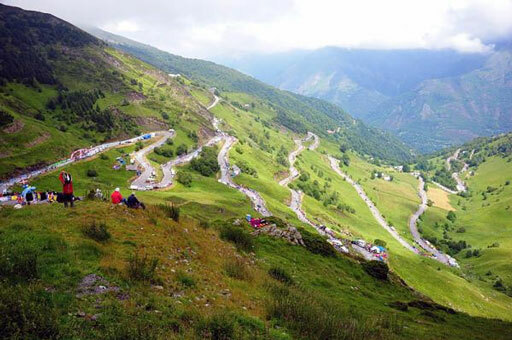 Well it features an HC climb up Col d'Aubisque but given the distance from the summit to the finish, it doesn't look like a day for a climber to win. 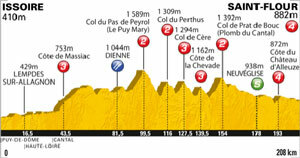 I suspect a break will form and an all-arounder will prevail, as the GC men wait for stage 14 which is another killer. Stay tuned! 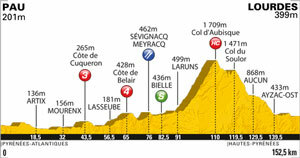 On to tomorrow, perhaps the decisive stage of this year's tour, with six climb on offer including a mountaintop finish at the top of Plateau de Beille, one of the most feared climbs in the Pyrenees. I'm looking for a big break to take off over all those early climbs, with the GC leaders staying together, but then heavy attacking from the base of the final climb. My own pick is Contador to win - he will assert himself, he has to - but Andy and Frank Schleck will stay close enough to avoid damage, and Cadel Evans will move into yellow. Wild cards include Ivan Basso, who looked great in stage 12, and Samuel Sanchez, who won it and who could reclaim polka dots. I cannot wait! Some interesting subplots did emerge: Samuel Sanchez finishes second, a clear 30s ahead of the pack, to move into sixth and declare his candidacy for the podium, as well as King of the Mountains. Levi Leipheimer was nowhere to be seen, nor was Robert Gesink, nor Tom Danielson. The GC contenders now (in order of likelihood of victory) are Cadel Evans, Ivan Basso, Alberto Contador (who looked better but not great), Andy and Frank Schleck, Sanchez, and Voeckler. Another interesting subplot was Mark Cavendish' bid to hold his green jersey, his team pulled him in over the time limit with just a minute to spare. 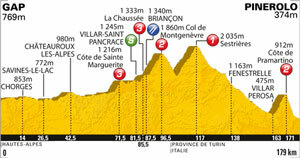 Tomorrow is a ho-hum sprint - well it could be exciting, because it's the last of this year's Tour until Paris - and after that we have a rest day, four mountain stages in the Alps including two mountain top finishes, and the final time trial in Grenoble. So there's a lot left - stay tuned! Today is the Tour's second rest day; tomorrow begins the first of four Alpine stages (including two mountaintop finishes, one atop the Col du Galibier! and one atop Alpe d'Huez!). 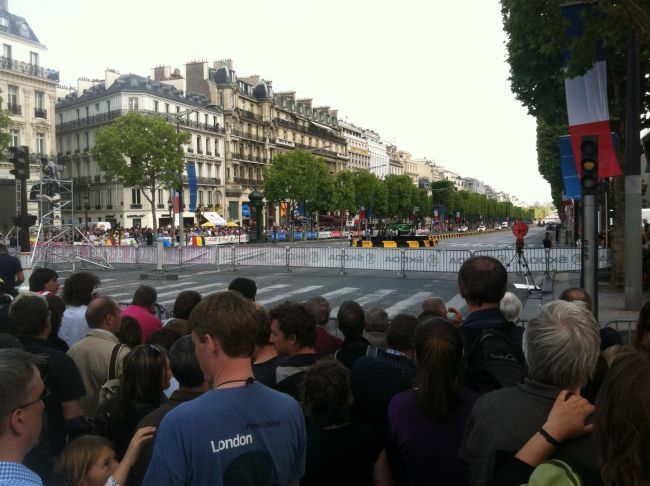 After that is the long ITT in Grenoble, and the finishing parade in Paris. Rainy weather is predicted and it should be an amazing shootout all week; I can't wait. It is truly the calm before the Alpine storm. 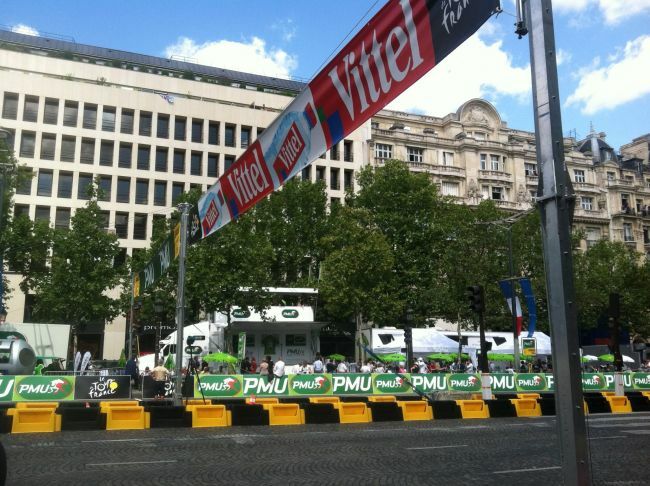 Will Voeckler hold yellow? Can Evans finally win? Will the Schlecks attack, and will it work? 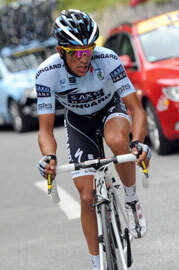 Can Contador defend? We'll see ... onward! 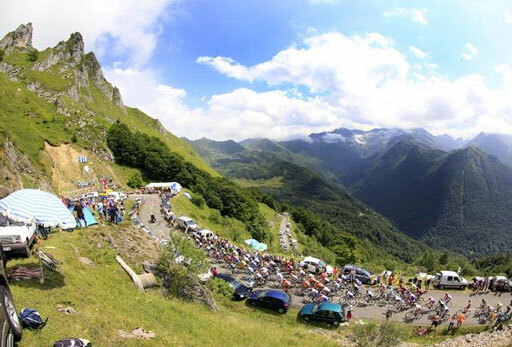 And so yesterday we reached l'Alpe d'Huez, the ultimate climbing stage of the 2011 Tour even though stage 18 was arguably harder and longer and hence the "queen stage". Partially it's because of the mystique of l'Alpe - the 21 hairpins with the stage winners celebrated at each one - and partially it's because this is the last stage before the ITT later today - and partly it's because the stage is so short; despite the Col du Galibier en route everyone reaches the bottom at the same time, everyone attacks, and may the best man win. 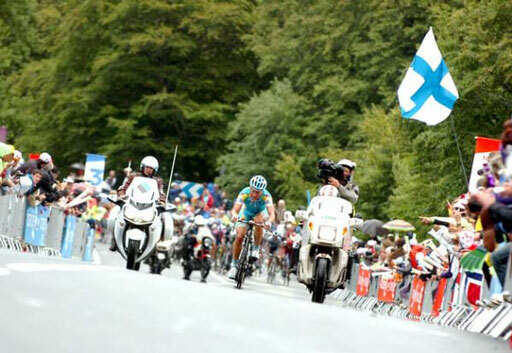 So it was the last time l'Alpe was in the Tour, in 2008, when Carlos Sastre won it and won the Tour. So what happened? 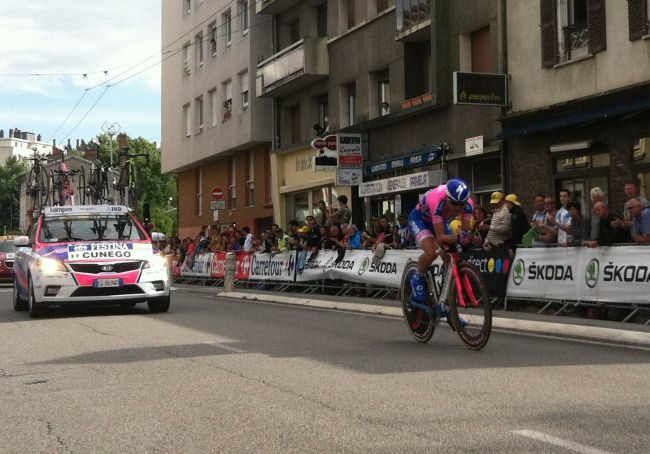 Well we had the usual early break, but then Alberto Contador attacked! One day after falling out of GC contention after being unable to stay with the leaders on the final climb, he seemed to be the Alberto of old. Only Andy Schleck could stay with him on his dynamic accelerations, with Cadel Evans and Thomas Voeckler struggling to stay on. And then Voeckler finally cracked and fell off. 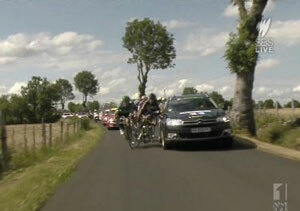 And then Evans had a mechanical, had to switch bikes, and suddenly was under pressure to stay on. 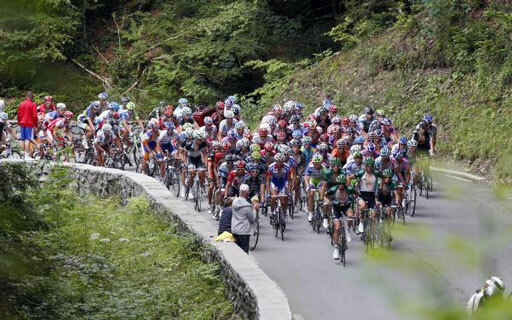 Even before we reached l'Alpe the peloton was all over the mountain. 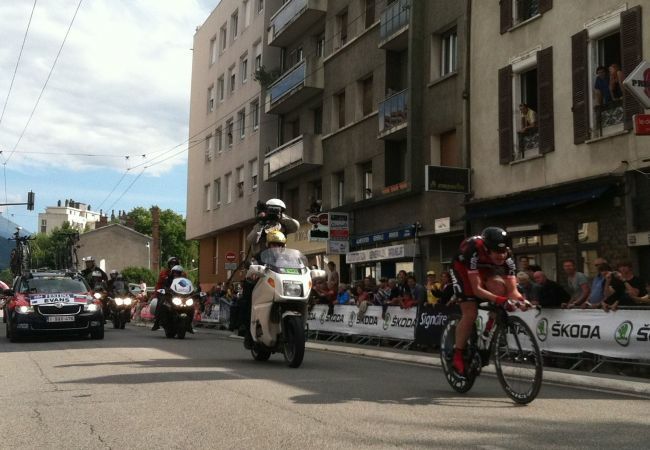 Evans BMC team restored order and began a solid chase, so that by the foot of l'Alpe there were about 30 riders again. 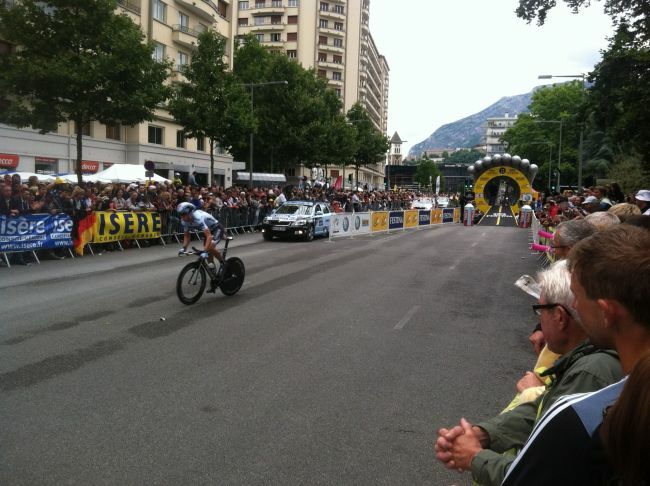 On the final climb Contador attacked again (!) and seemed headed for victory, with Evans driving a hard chase, both Schlecks on his wheel, shedding Voeckler for the final time and dropping him from yellow. 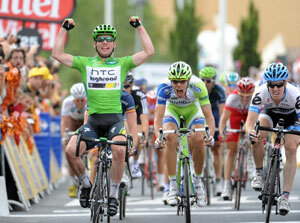 Samuel Sanchez attacked, and then Voeckler's teammate Pierre Roland followed, seeking the white jersey. Near the seemingly unreachable top Contador lost steam, and was ultimately passed by Roland, who won (and took White), and Sanchez, who ended up second (and in Polka Dots). 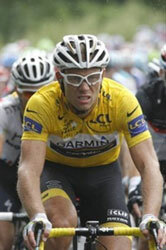 Evans drove the leaders to the top, putting Andy Schleck in yellow for the first time. I have to say, today I liked Alberto more than at any time before; he might not have won the stage or the Tour, but he won the respect of the fans. 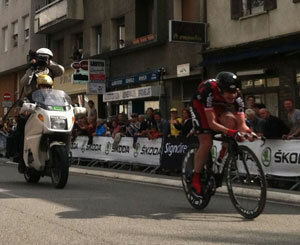 So going into today's ITT we have Andy in first, Frank 2nd (0:53), and Evans 3rd (0:57). 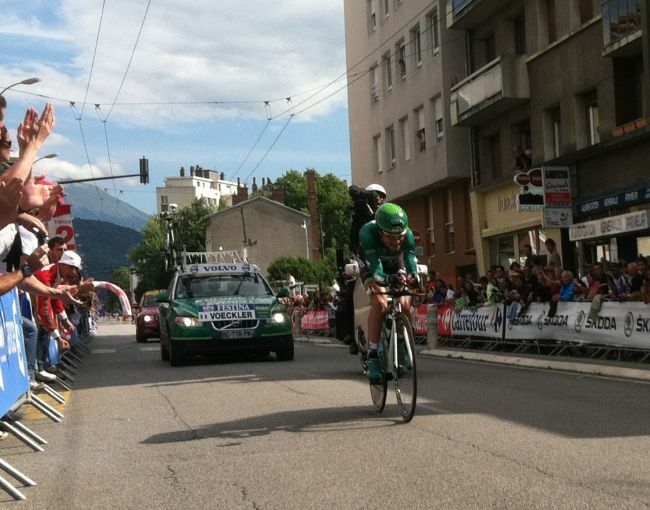 Voeckler has dropped to 4th (2:10). 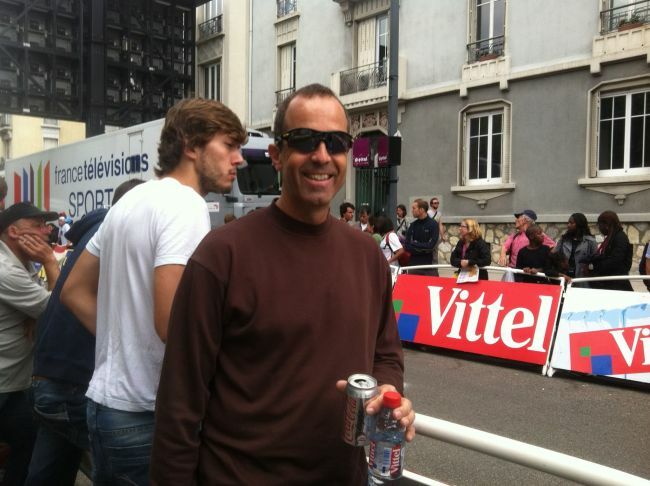 I think Evans will easily take a minute from both Andy and Frank, and will win the tour. I don't think Cunago (3:11) or Contador (3:55) can make the podium. We'll see - stay tuned! 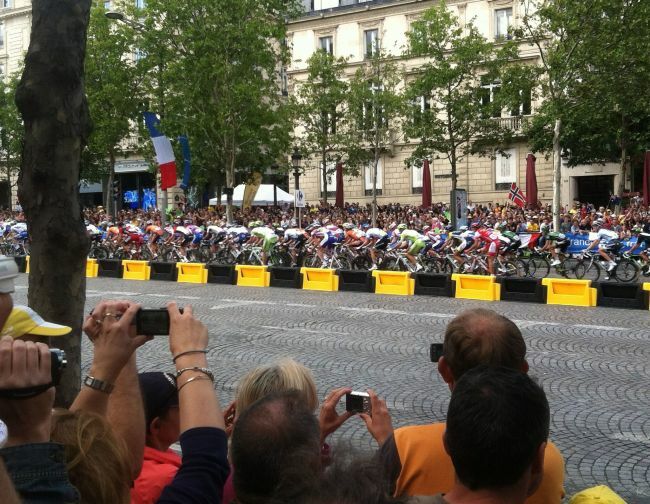 So yesterday was amazing; Shirley and I were in Grenoble watching stage 20 of the Tour de France. I took a bunch of pictures - how great is it that you can just walk up to a Tour stage and watch it close up? 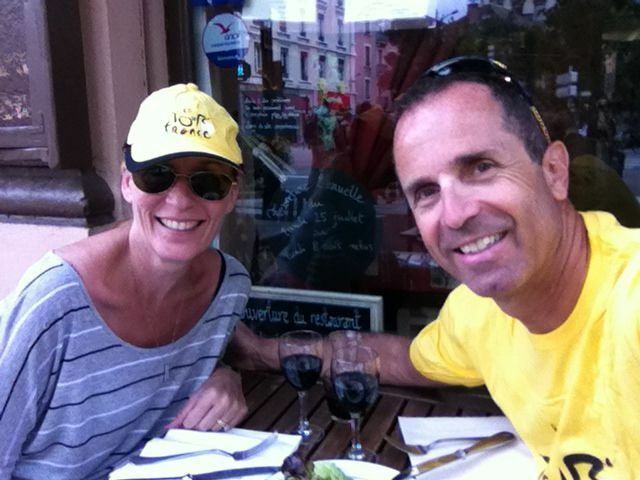 - and we enjoyed ourselves thoroughly; everything from the TGV down from Paris (600km in 2 1/2 hours!) 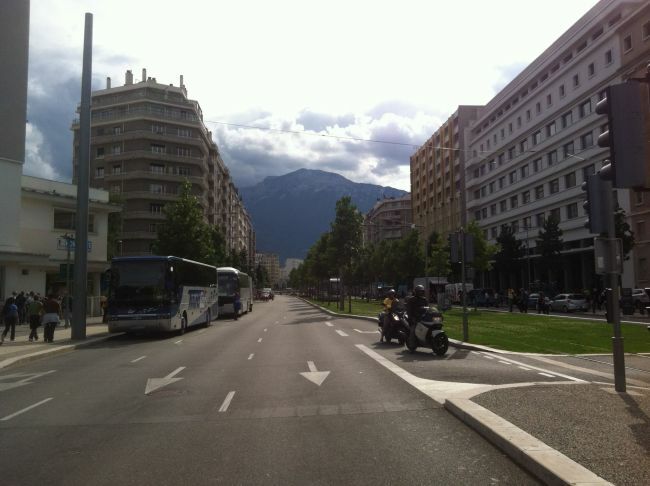 to the beautiful city of Grenoble itself to the pageantry and of course the excitement of the ITT as the Tour was decided. look for him to come back strong next year! Just an awesome day. 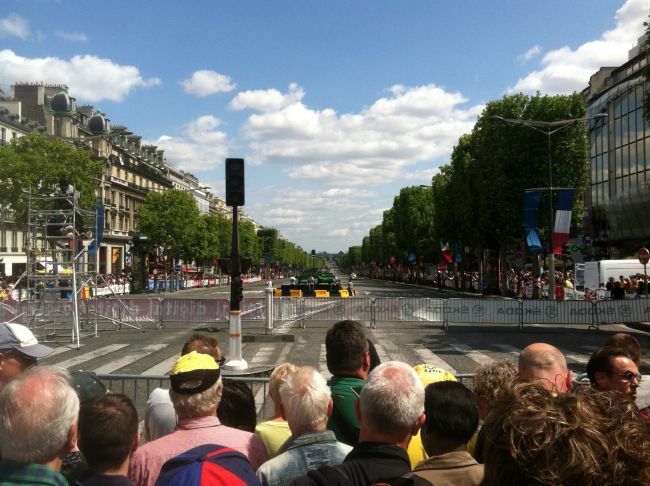 And later today we're off to the Champs d'Elysee to see stage 21 and the final finish. Stay tuned! 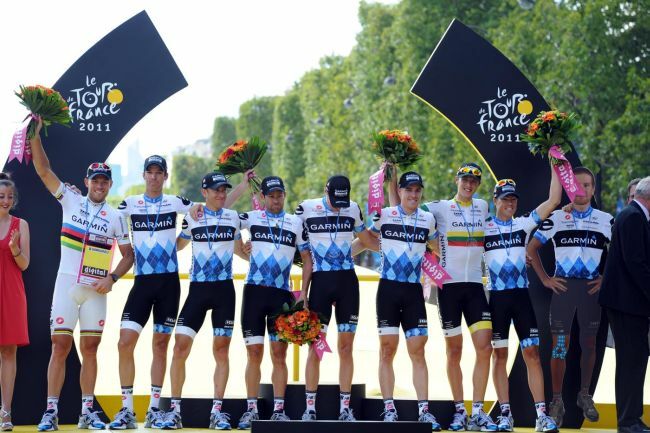 Well I'm a bit late with this, but for form's sake (and because I have some things to say) I thought I'd wrap up the 2011 TDF. Overall this was the best tour in a while, I'd say since 2003, when Lance Armstrong had to really work to beat Jan Ullrich, with Alexander Vinokourov third. 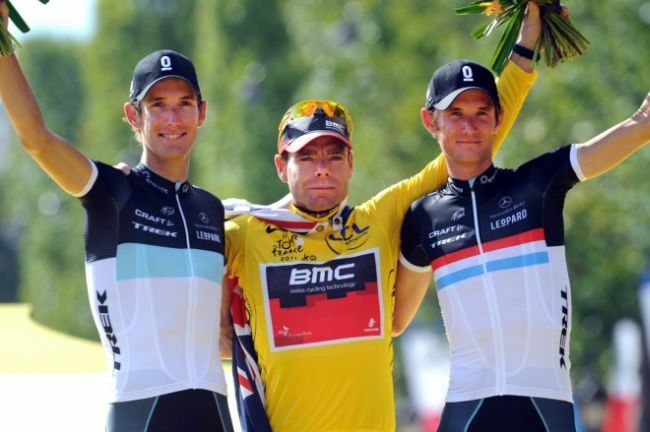 As then, we had three clear favorites (Alberto Contador, Andy Schleck, and Cadel Evans), with many crashes, unexpected leaders, and incredible attacks. There were so many crashes the first week, and it isn't apparent why. And so many contenders were knocked out, Bradley Wiggens, and Andreas Kloden, and Alexander Vinokourov, and Chris Horner, and Tom Boonen. 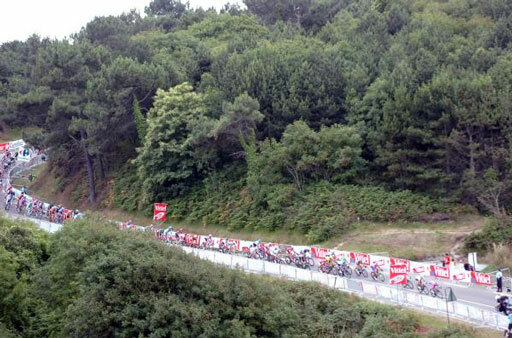 That whole incident with the TV car hitting Franco and knocking Johnny Hoogerland into a ditch, wow. That will be in highlight films forever. 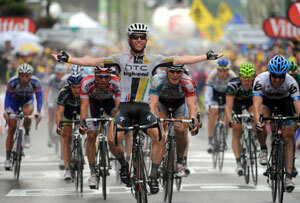 How great was it to see Thor Hushovd in yellow for a week, and then winning two "mountain" stages? He's got to be my favorite rider at this point. I wish there was some way to give a "most incredible riding" award for the Tour. 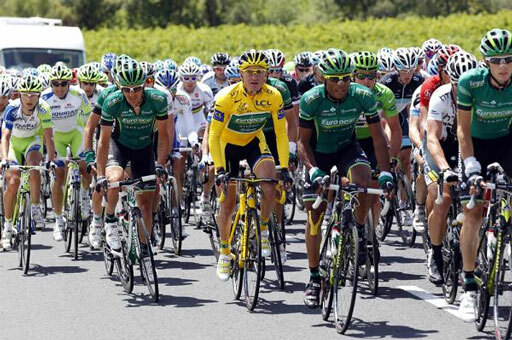 And how great was it to see Thomas Voeckler in yellow for a week, gamely hanging on to keep it just like in 2004? He's got to be one of my favorite riders too. Just awesome. And great for France, and for the Tour. It was cool to see Eurocar do so well, with Voeckler and Pierre Rolland, who had a great tour and won on l'Alpe d'Huez and took the white jersey. 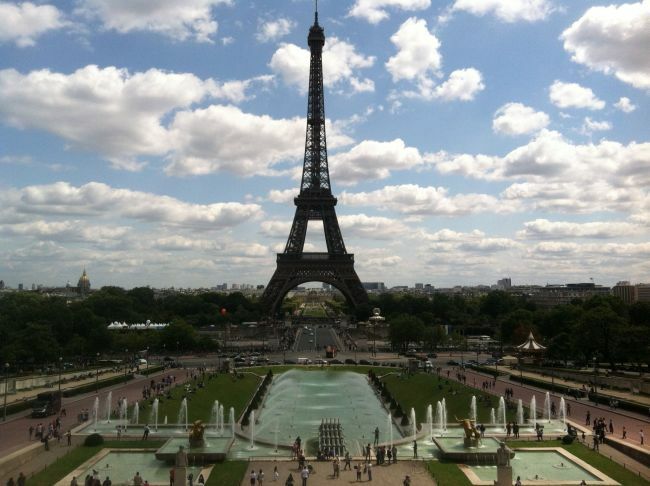 Again, great for France, and for the Tour. Garmen was the team of the tour, not only with Hushovd, but winning the team time trial, Tyler Farrar winning a sprint, and animating all the time. Too bad they lost Zabriske, and Vandevelde was not great, but Danielson did finish 9th and the team had the best time overall. I will say I expected a better battle for the green jersey, I thought the intermediate sprint points would help someone like Philippe Gilbert compete, but it didn't work out that way. 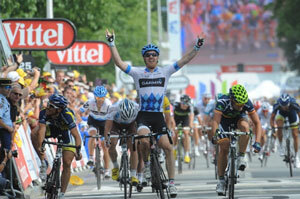 Would have been great, I like all-arounders like Gilbert. Looking back, stage 9 was amazing; eight categorized climbs but nothing harder than a Cat 2, a serious break, the TV car crash thing and other crashes too, and Voeckler taking yellow by two minutes. The final three stages were awesome. 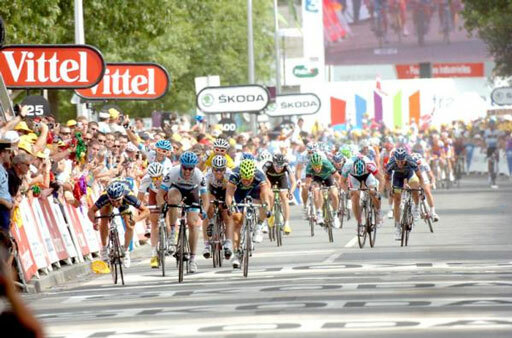 The Schleck attack on stage 18, 70km from the finish, with Evans forced to chase over three HC climbs up to the Galibier, and then the Contador attack on stage 19, way out, with Evans again forced to chase and the finish at Alpe d'Huez, and then the time trial. Being in France while this all played out made it even better (thank you Tivo + Slingbox + hotel WiFi :). Cool that George Hincapie was on nine TDF winning teams, with three different riders. Wow. Sanchez was a great kind of the mountains; for once, you felt the award went to the best climber. Not only in the Alps at the end, but in the Pyrenees too. Evans won the way you should win; with a great team that kept him out of trouble, consistency, taking control when needed to chase down attacks, and then blasting to victory in the time trial. He was the champion (and the pride of Australia). Best of all, no doping! and not even much talk of doping, despite the Contador situation. Whew. Finally, some comments on the commentators; what can we say, Phil Liggett and Paul Sherwin remain a delight, and they had a great tour too. Bob Roll continues to have the best insights; he called the Schleck attack on stage 18 and the Contador attack on stage 19 perfectly. I'd love to have Bob's insights during the racing. Ian McHugh was horrible, worse than Craig Hummer (who got better over time), and I'm sure he won't be back. The whole NBC involvement was weird; their online package was a joke, and their incessant house ads were horrible (thank you Tivo). We'll see what happens next year. And it should be great! 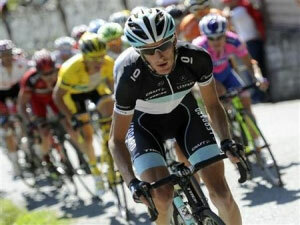 with Evans back, and the Schlecks, and Contador, and who knows who else?